One of the most important factors in marketing is the way we promote our brand and offer different items to our clients to be able to differentiate from our close rivals. If we think about mugs, these are standard items that are already in the market and people can see them everywhere branded. However, why not innovate a bit the design? Make it unique so that it grabs customers attention since the very first glance. Make your marketing gift look incredibly amazing! 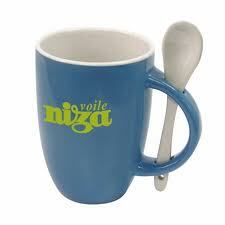 Firstly, it includes a spoon which most mugs in the market don´t have; so it is already something different. Secondly, we could use an elaborated gift box to present our marketing gift to our customers which will already increase our product´s value drastically. This marketing gift is a product that customers will find really useful when they have breakfast or snacks as the spoon is already included with the mug which means that it is easier and quicker to stir the components in our drinks. The gift box can be easily designed at your requirement with any specification as well as the mug and the spoon. Normally the inner part of the mug and the spoon have the same color and the we can add any kind of printing logos in different positions. We could use different kind of ceramic but the high quality ones are Grade A which lack defects and is at a great quality standard. Customers always like to purchase a marketing gift that is completely different from the rest. Packaging is a very important factor as the way a promotional product is presented will increase the product´s value which is crucial in competition.